— A grateful nation thanks all of your very generous hearts and outpouring support in the rescue/relief/recovery/rehabilitation efforts on the devastation brought about by Typhoon Yolanda, a category 5 Hurricane, a very strong storm (International code name:Haiyan). 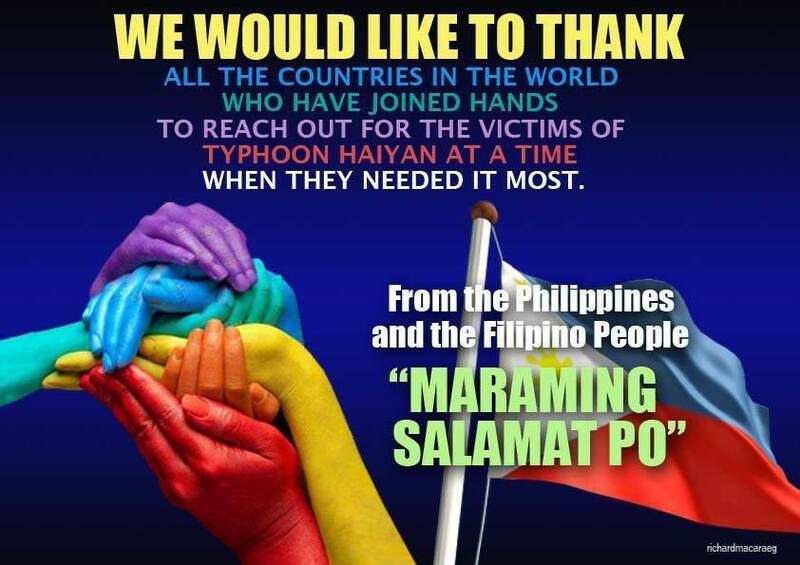 May every Filipino you encounter in the world thank you all personally. Our people affected by the recent natural disasters may not have a very Merry Christmas, but because of all of you, they will feel that there is hope for one. God-bless all of you and all those in this country who make it better for others in need. Thank you to the country and it’s people. List of country is alphabetically. BELGIUM – medical and search and rescue personnel + relief goods and water treatment units. cash donation is waiting for official accounting. AND ALL OTHER COUNTRIES AND PEOPLE WHO HAVE SENT THEIR THOUGHTFUL MESSAGE, SYMPATHY AND EMPATHY! Once again, we thank you from the bottom of our heart! We will forever be grateful! ← An Open Letter to the Public! Makes you love the world. Thank you Jo!In tragic times like this, I am and I believe so are my fellow men, are truly thankful for the outpouring aid, good thoughts and best intentions from everyone all over the world. I wonder how much of this money will actually get to the people and how much will end up in the pockets of all the corrupt politicians who run the country. That is a good question. But I’d like to believe and keep hoping that at this devastating time where there’s more people in need, that the corrupt politicians and people-in-charge will do their duty with integrity and honesty. That they do feel empathetic and have conscious. I hope that the politicians and everyone in charge will have conscience at this point in time! Thank you. Solidarity in times of disasters or catastrophe is needed. And be thankful for all that was given from everyone and everybody. It truly is! Thank you. It means a lot for people coming together as a nation. My best wishes to you and yours Jalal! I genuinely enjoy reading on this site, it holds wonderful articles.